The signs hanging in the Seed Spot office could be in just about any business, but they’re critical to the thinking of an entrepreneur. 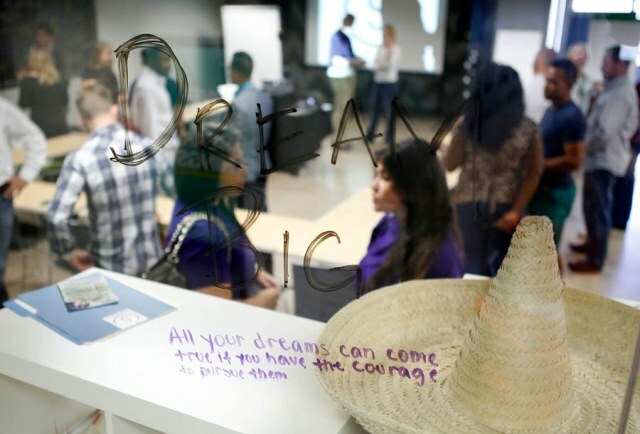 The “Dream Big” message on the window of the meeting room at Seed Spot is typical of the can-do attitude at the Phoenix business incubator. Friday morning, a group of students from Grand Canyon University got a valuable look at how entrepreneurs must use those and other power-of-positive-thinking ideals in their quest to bring their products to the marketplace. The occasion was Seed Spot’s “Venture Friday,” in which entrepreneurs pitch their ideas to their Seed Spot mentors, potential investors and anyone else who wants to attend — in this case, GCU students looking to either hook up with small business owners or learn more about becoming an entrepreneur. As with GCU’s “Canyon Challenge,” each competitor had three minutes to do a quick presentation about what the business is, what market it is designed to serve, why there’s a need for it and how it will make money. All of the speakers are going through the 14-week mentoring program conducted by Seed Spot, a business incubator committed to increasing the rate of success of entrepreneurs and thus helping the community. GCU senior Lemmy Gitahi listens to one of the presentations at the Seed Spot meeting. In its three years, company officials say, Seed Spot has helped 106 small businesses get off the ground. The success rate is extraordinarily high compared to that of most small startups: 88 percent are still in business, 93 percent are still in Arizona, 102 jobs have been created, $1.4 million has been invested and an estimated 48,282 lives have been impacted. The effect on the community is an essential piece, and the mix of industries is fairly diverse. One-third of the ventures that Seed Spot has helped are related to health, and education, human rights and environment make up 18 percent apiece. The other 13 percent have been civic-related startups. The catalyst for GCU’s relationship was Tim Kelley, assistant professor of entrepreneurship and economics in the Colangelo College of Business and chairman of the Thunderbird Angel Network, a group of accredited investors. It didn’t take long for Kelley to see the potential. Kelley hopes to expand the Seed Spot initiative to include local high school students with entrepreneurial dreams. Courtney Klein, co-founder and CEO of Seed Spot, said the partnership with GCU is her company’s largest with any school. In addition to opportunities to meet entrepreneurs through Seed Spot, students from across the University also can get valuable experience on campus in the monthly “GCU Shark Tank” meeting. The first one of the 2014-15 school year is scheduled for 5 p.m. Thursday, Oct. 16, on the second floor of the CAS building next to the IDEA Lab.